The Asian Ministerial Conference on Disaster Risk Reduction (AMCDRR) took place from 3-6 July, 2018 in Ulaanbaatar, Mongolia. This time, the Regional Platform had the overarching theme of ‘Preventing Disaster Risk: Protecting Sustainable Development’, reflecting on the fact that development must consider risk in order to be truly sustainable. 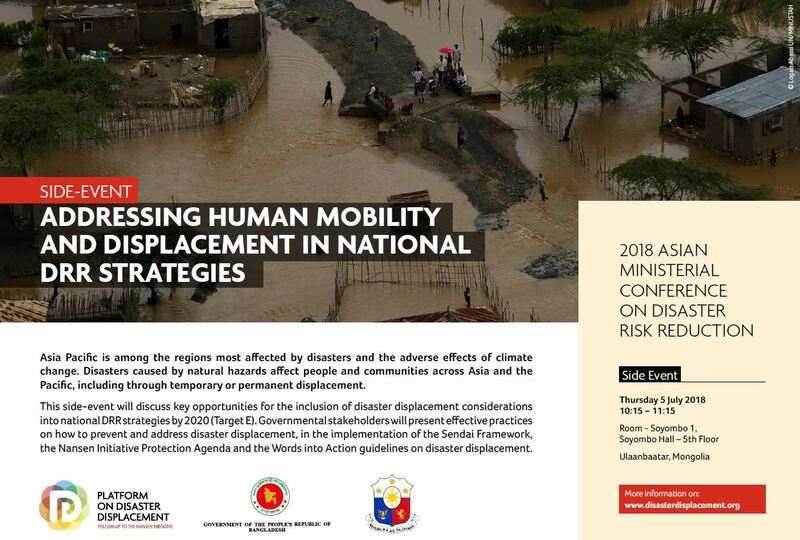 At this Regional Platform, PDD, with its Chair, Bangladesh, and Steering Group Member, the Philippines, organized a side-event entitled Addressing Human Mobility and Displacement in National DRR Strategies on 5 July at 10:15-11:15 in the Soyomba 1 room in Soyomba Hall. The panel spoke to the challenges of disaster displacement and other types of human mobility and how they can best be addressed in DRR policy and practice. As the AMCDRR took place only two weeks after the Regional Workshop on Disaster Risk Reduction, Preparedness and Disaster Displacement, hosted by the Government of the Philippines with participants from 11 Pacific Island Countries and Timor Leste, this event brought the outcomes and lessons of this workshop to the Regional Platform and provided an opportunity to share a video sharing key messages from the workshop. Panelists from Asia and the Pacific showcased their country’s efforts to integrate human mobility and displacement considerations into national DRR strategies, in line with Target E of the Sendai Framework. 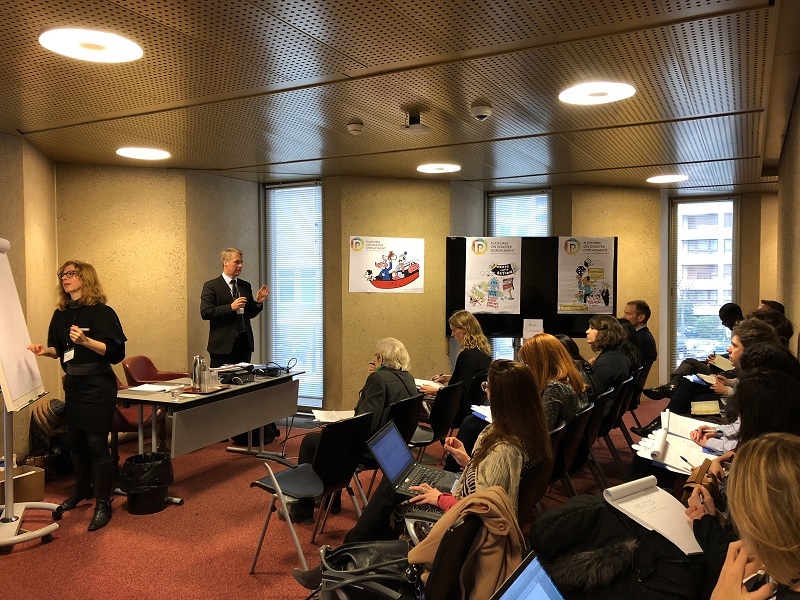 PDD’s side-event directly followed another displacement-related side-event hosted by the International Federation for the Red Cross (IFRC) titled Disaster Risk Reduction and Displacement: The Importance of Local Actors and Local Action. This event took place on 5 July at 09:00-10:15 in the Soyomba 1 room in Soyomba Hall and highlighted the role of local actors in addressing the challenges associated with disaster displacement. The session looked at practical experiences, challenges and solutions of local action in implementing DRR initiatives that prevent and prepare for displacement. Panelists included government officials and Red Cross representatives from Bangladesh, the Philippines and the Solomon Islands. 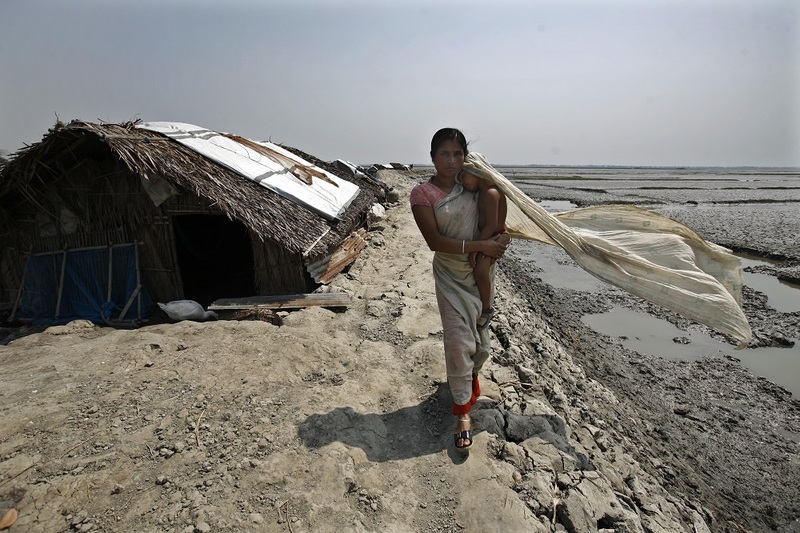 Also at the AMCDRR, the Norwegian Refugee Council (NRC) launched the public consultation of the Words into Action guidelines (WiA) on disaster displacement, giving special focus to its applicability in the Asia Pacific region. The event, entitled Disaster Displacement: How to Reduce Risks, Address Impacts and Strengthen Resilience, took place on 3 July at 18:30-20:00h at the Shangri-la Hotel in room Tokyo. These guidelines have been elaborated under the PDD workplan and the leadership of NRC, with support from Germany and several of PDD’s Advisory Committee Members, including the International Organization for Migration and the United Nations High Commissioner for Refugees. 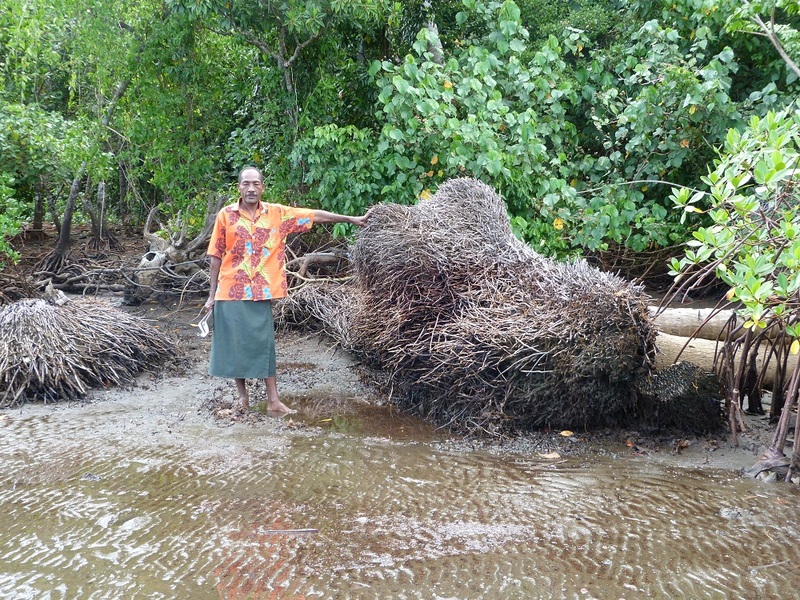 The Words into Action guidelines aim to help government authorities at all levels integrate disaster displacement and other related forms of human mobility into DRR strategies, implementing Target E of the Sendai Framework. The guide provides basic background information and highlights how DRR can play a role in reducing, preparing for and responding to disaster displacement and focuses on how to reduce risk associated with displacement, address impacts and strengthen resilience. The WiA also contains a checklist that intends to help assess whether a DRR strategy is fully aligned with the Sendai Framework with regards to reducing disaster displacement risk. The panel will consist of a variety of stakeholders, including Governments, International Organizations and NGOs, discussing how the guide can be used in the Asia Pacific region. To learn more about the Words into Action or to provide feedback on the draft, please do so on PreventionWeb. The document is available in Arabic, English, French and Spanish and is currently open for public consultation to ensure that no important considerations have been overlooked. As a result of advocacy, the three side-events described above and mention of the 9 million people displaced by disasters in the Asia Pacific region in 2017 by the Secretary-General in a video message, disaster displacement is prominent throughout Platform’s two outcome documents: the Asia Regional Action Plan 2018-2020 and the Ulaanbaatar Declaration.